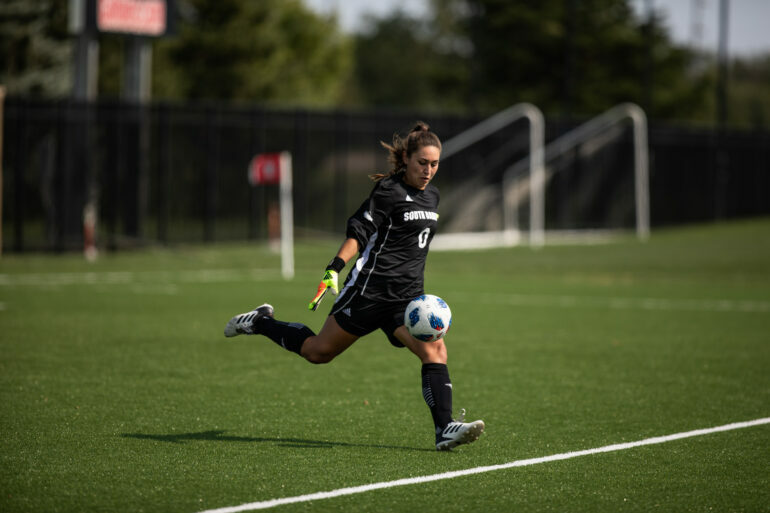 Coral Suarez is a senior nursing major and goalkeeper on the soccer team from Thousand Oaks, Calif.
Austin Lammers: What’s the one thing you miss most about California? Coral Suarez: I would say the beaches. And the constant 75-80 degree weather. AL: If you weren’t a goalkeeper, what other position would you be most confident playing? CS: Probably outside, midfield, or a forward. AL: What specific area do you want to enter in the medical field? CS: I’ve been looking at so many, but specifically an anesthesia technologist. AL: What’s the biggest thing the general public doesn’t understand about goalkeeping in any sport? CS: We’re under pressure a lot and the last defense, but when it comes to our position, it’s the training. It’s not just how fast we can get to the ball but it’s footwork and agility and the work we put in. AL: How do you keep yourself entertained during games where the ball is always at the other end? CS: I make sure our back line is organized, keep talking, and watch the game. You have to be engaged at all times. But when I was little I watched games on the other fields.